Bolivian Sports. Fun Facts About Bolivia. Bolivian Traditions. Bolivia Sports. Bolivian sports fanatics can keep up with Bolivia sports news by clicking over to our Bolivia news and current events page for continually updating news. The following is for those of you who are looking for a description or list of Bolivian sports or just want some fun facts about Bolivia sports and how Bolivian traditions and culture are influenced by sports. First of all, the main sport in Bolivia hands down, is soccer! No other sport can rival soccer in Bolivia, which is Spanish we call futbol. It's played mostly by men and boys but women and girls are beginning to participate little by little. Bolivia is still a fairly chauvinist society and when it comes to girls or women playing soccer, men don't take them seriously, won't usually play against them in teams, and don't believe they are as athletic or capable as men. However, female athletes are slowly breaking down the barriers. 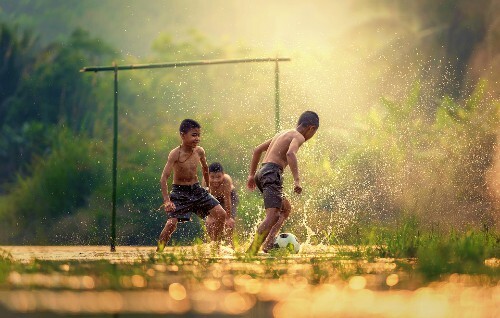 Children grow up playing soccer on the streets using anything that will do for a ball or a goal. By the time they are teenagers, some of them are very good! No amount of rain or mud can stop a soccer match. Bolivians like to joke that soccer is like a religion and the truth is soccer fanatics really are addicted to the game; so much so, that Bolivia sports fans often get into brutally physical altercations at soccer matches. Going to soccer games on Sundays is one of the most ingrained Bolivian traditions. Really die-hard soccer fans plan their social life, life and work around it. The sport has divided entire families. However, soccer can also bring rivals who normally detest each other together and suddenly everyone is one big happy family again. It's one of the idiosyncrasies of soccer in Bolivian life. Something really awesome happened during a soccer match in 2009 that portrays what I mean by this. Read about the soccer game that united Bolivians here. There are also many other Bolivia sports such as tennis, raquetball, swimming, horseback riding, golf, gymnastics, racing (as in cars), skiing (except our glaciers are melting), mountain climbing, hiking, running and jogging, and all types of track and field, rollerblading, volleyball and others. There are also motorcycle races and bicycle racing or mountain biking. Also in some areas people do waterski or use waverunners, but these are not that common as most people can't afford them. Also, in areas where there are hills and mountains lots of people, including tourists, do rappelling and rock climbing. In the tropical areas where there are very voluminous rivers you can do whitewater rafting. In some jungles you can do canopy tours. This is actually ziplining where you sit in a harness or sling and slide very fast along a metal cable through the tops of the trees (the tree canopy). If you consider hunting and fishing as a sport, there is a lot of that here too. The exceptions would be American football and baseball which are not played here almost at all. Once in a while you'll find a few people trying to form teams (such as between foreign company employees or something), but neither one has really caught on fully anywhere. Also, there is no ice skating or ice hockey because we don't have ice rinks. There used to be a tiny ice skating rink in Santa Cruz but it didn't last very long. People just didn't get used to it in the hot tropics of Santa Cruz. Also the investors apparently didn't know much about ice skating because it was extremely tiny! Mostly we play the same sports in Bolivia as are played in many other countries, but none is as big a deal as soccer. Soccer is Bolivia's national sport and probably will be for a very long time to come. Click here to read about some athletes who are famous in Bolivian sports.